The Nairobi Farmers Market, which is under construction in the upmarket Runda Estate, off Kiambu Road, will contain 45 stalls that are exclusively operated by farmers. This borrows from international practice where most cities have farmers markets that supply produce direct from the farms to the consumers. While some provide temporary selling space for different farmers on a day-to-day basis, others lease out permanent shops that are operated by individual farmers who take the space on a long-term basis. “We are essentially addressing the contradiction where farm-gate prices for cabbages, for example, are less than Sh10 a piece but the consumer pays Sh60. In-between numerous traders, brokers and county levy collectors eat the sweat from the farmer and the savings from the consumer. We are creating a facility that will be a big help for both the farmer and the consumer,” says Mr Munene Mashine, the Project Manager. He says the other concern the market will address will be traceability of produce and guarantee of good agricultural practices. All the farmers/shop owners will have to submit to regular inspections and certification, similar to what is required of export produce. Questions have been asked about some of the fresh produce sold in Kenya, with suspicions that some of it is grown with sewage and other polluted water. The proposed market, which is expected to open in July, will contain sections for fresh produce, Beef, fish and poultry products, dairy produce and a grains section. The Mwea Rice Centre within the market, for example, promises to provide “Mwea rice at Mwea prices” – a potentially revolutionary approach that will ensure great conveniences for Nairobi shoppers keen on the popular Pishori rice. 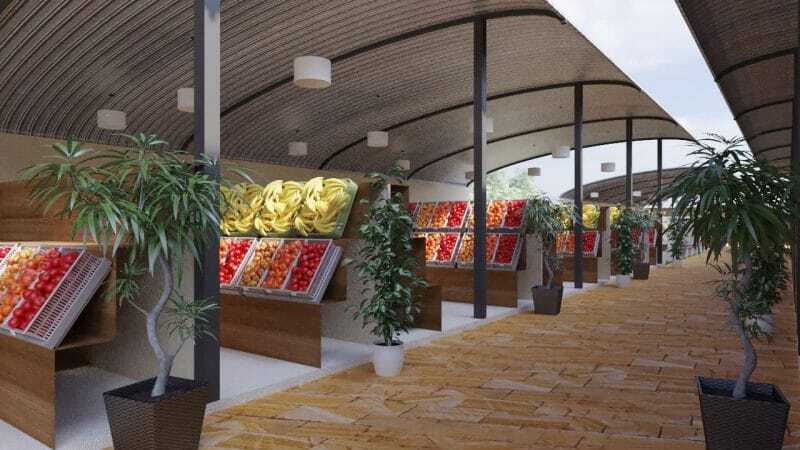 An artist’s impression of the Nairobi Farmers Market in Runda, which will open in July 2019. The market developers say they will encourage stall owners to contract and supervise small-scale growers to ensure sufficient supplies within the set quality guidelines while also spreading the benefits of the market to more farmers. By aggregating produce from the many farmers in the market, they hope to create a secondary outlet for supplying institutional customers such as hotels, restaurants, schools and hospitals. This will ensure and an expansive market potential that can provide an outlet for thousands of farmers. “We will encourage shop owners to sign up outgrowers across the country, and even to work with County Governments where necessary. This way we can create an efficient road to market for the exceptional pineapple growers of Homa Bay, the sweet potato farmers in Kakamega and the honey producers in Baringo and elsewhere. We are creating a platform that offers guarantees at both the supply and demand side of the equation and hopefully we can provide some stability for everyone,” says Mr Mashine. Globally, farmers’ markets usually include an eating out section where freshly-prepared dishes are served. The markets, such as the Borough Market in London, La Boqueria in Barcelona and the Shongweni Farmers Market in South Africa, are top tourist attractions as they provide a good perspective of what the country has to offer. The Nairobi market will also have a restaurant and since this is Kenya, a nyama choma outlet. Some farmers will be selling produce that has gone through some basic primary processing. The market is being developed by a local investor, United Agromarts Limited. In order to also be in tune with modern shopping trends, the market plans to launch an aggressive home deliveries campaign driven through the Nairobi Farmers Market App. “It will be a blend between the Uber and the Jumia technologies – you do your shopping online, and we are able to find where you are using the Google Maps facility. We will launch this as soon as the market opens and people see they can trust us, they don’t have to touch and feel the tomato before dropping it into the shopping basket. I think when people have worked so hard to earn their money, they shouldn’t always have to run all over the place to spend it. We will do the running for them,” says Mr Mashine.